Top seed Andy Roddick and No. 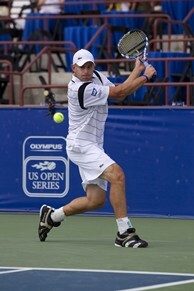 7 seed Xavier Malisse will play Friday evening in a rematch of the 2001 Verizon Tennis Challenge final. The last time an ATP World Tour final was played in Atlanta, the then 18-year-old Roddick won his first ATP World Tour title defeating Malisse 6-2, 6-4. Kevin Anderson and Lukas Lacko will begin play at noon on the Stadium Court and four Americans will also be playing in Friday's quarterfinals. Michael Russell and No. 2 seed John Isner will meet for the third time in their careers and Taylor Dent will face off against No. 6 seed Mardy Fish to conclude the evening.